We have gone through so many pencil sharpeners over the years. Those little plastic ones, several battery operated, a plug-in electric and even a wall mounted traditional school sharpener. Every one has failed us. 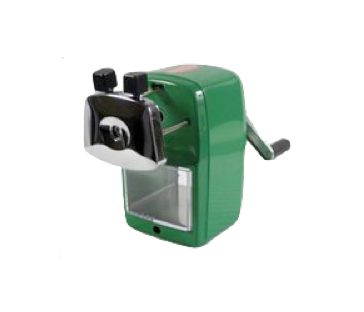 However, once we tried the Classroom Friendly Supplies sharpener - it was total love! 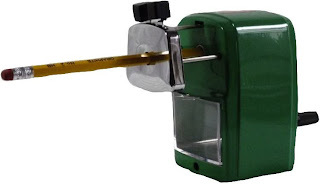 ClassroomFriendlySupplies.com has what I consider to be the best pencil sharpener you can buy! No need to wall mount it either! This sharpener is different than others I have used. You have to pull the top piece out then insert your pencil. Then you crank the handle and the sharpener does the rest. Super Easy - even my 4 year old can sharpen pencils with ease! We have been using this sharpener for over two years and couldn't be more happier with the results and the durability! It really is the best out there! I'm so excited to include have the opportunity to give one away to a lucky reader! One of my lucky readers is going to win their own Sharpener from Classroomfriendlysupplies.com! I honestly would buy one of these sharpeners. I had one in my classroom this past year and the kids loved it. It sharpens really well! As a first year teacher I NEED this amazing pencil sharpener! I used one during my college internship and absolutely adored it. Hope I win!!!! As a substitute, I have learned to take my personal sharpener with me. It never fails that the teacher's sharpener is broken, dull, and/or loud and we spend way to much time on sharpening pencils. In the meantime, other teachers see my sharpener, love it, and order their own. I give them to college graduates that are going into teaching. It's a big hit! I am proposing that our PTO buy one for every classroom in the building. !! These sharpeners are the best! Really hope I win one!! I don't know what I would buy -- hoping to win the pencil sharpener. I really like the blue and red pencil sharpener. Would love to have one in my homeschool. I would buy the firehouse red sharpener for sure! If I win, I'd likely choose the green sharpener. With 3, almost 4, boys the pink one is out ;). And they each have a different color, so I don't want them thinking I'm playing favorites. That means the choice is one that isn't anyone's favorite color! I need a good pencil sharpener! I've tried various ones too and still haven't fallen in love with any of them. I really need a pencil sharpener badly! Love the color choices... it would hard to pick but I think I would go with green. I would probably buy black. But the pink one looks so pretty! I love sharpened pencils! This would be great to have in my classroom! I really like the precious pink sharpener i think my girls would chose that color. Anything would be better than our cheap 50 cent pencil sharpener we have now. I had a sharpener just like that back in the 1960s, only mine was brown. It was manufactured by a Japanese company, I believe. I didn't know they were still making them!